BA Series Bass Combos - Classic Tone. Modern Flexibility. Rugged Portability. 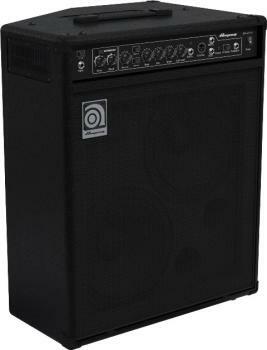 The Ampeg BA-210 Bass Combo Amp delivers classic Ampeg tone with features designed for maximum performance on stage. Featuring the revolutionary grinding Bass Scrambler overdrive, this amp delivers classic tube-like grind. The BA-210 also features a true 60° monitoring angle with front-facing controls, auxiliary inputs and a headphone jack for when you need some personal time. Delivering classic Ampeg tone at volume levels perfect for keeping up with a full band, the BA-210 is the ultimate stage-ready powerful 2x10 inches combo. Ampeg is known for its classic tone and the new BA series is no exception. 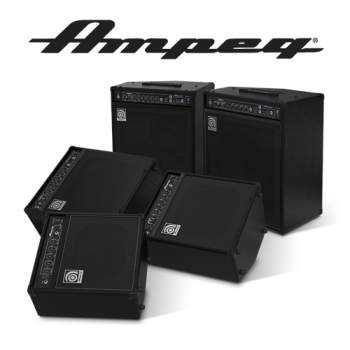 Each amp offers legacy Ampeg preamps and tone stack circuits for an extensive choice of classic Ampeg tone. BA series amps feature perfectly matched Ampeg Custom speakers, designed specifically to get the most out of your BA combo. The new BA Bass Combos feature an all-new cabinet design with a true 60° sound reinforcement monitor angle which provides an increase in clarity. This flexible design directs sound directly at your ears even in small spaces. Front-facing controls make adjustments quick and easy in both the upright and wedge position. Players can easily transition from a true monitor angle for added clarity or a traditional upright position for added bass response. Featuring a protective all-steel amp chassis, impact-resistant metal corners and rugged embraced enclosures, BA Series Bass Combos are designed for the long haul. Created for performance and portability, these amps are ready to go wherever you do.